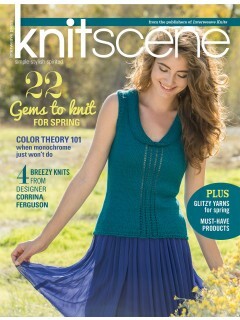 New projects to knit from Knitscene Spring 2014 with 22 projects to excite your knitting senses. This issue of Knitscene magazine combines a perfect blend of pullovers for chilly spring evenings, lighter pieces to layer or wear separately, and must-knit accessories. Knitscene Spring 2014 introduces the basic tenet of colour theory - examining contrast between two colours of yarn  and explores the trend of black and white garments. Knit tailored, feminine pieces in jewel-tone yarn with a focus on neckline details this spring. Plus, visit with designer Corrina Ferguson as she delivers sweet treats in her designer collection.